CFAES’s Jim Harper received an honorary doctorate in agriculture from Purdue University during spring commencement ceremonies at the West Lafayette, Indiana, campus in May. He retired last August as J.T. Parker Chair in Dairy Foods in the Department of Food Science and Technology. Harper served in active duty in World War II, received a medical discharge from the Army after being wounded in combat in Germany in 1944, and went on to earn a B.S in agriculture from Purdue and M.S. and Ph.D. degrees from the University of Wisconsin. After receiving his doctorate in 1949, Harper joined Ohio State’s Dairy Technology Department as an assistant professor and rose through the ranks. The department combined with the university’s Institute of Nutrition to become the Department of Food Science and Nutrition in 1971, and Harper developed all the non-dairy technology courses, taught, and conducted a research program. 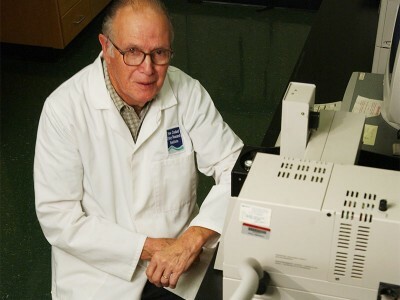 He retired from Ohio State in 1981 to join the New Zealand Dairy Research Institute. There he led a group of researchers who developed a whey protein concentrate program. Technology from that program still brings in more than a billion dollars a year to New Zealand. In the early 1990s, Harper was asked to return to CFAES’s Department of Food Science and Technology to teach. In 1993, he was appointed as the J.T. Parker Chair in Dairy Foods, a position he held until his retirement.